Does this design solution solve the engineering puzzle it aims attempts, or does it suffer from the same problems that plagued the original? The Zephyrus S is an odd duck. Other than its 17-inch screen, this new Zephyrus S is similar to the 2017 model. That doesn’t make it any less strange, though. 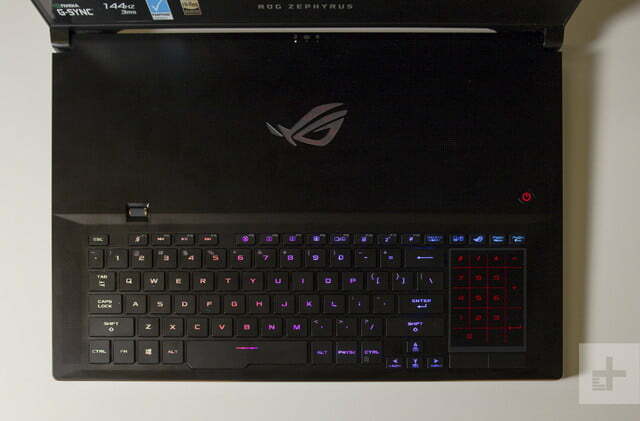 The keyboard and have moved towards you, the gamer, leaving the majority of the keyboard deck blank, stylized only with an oversized ROG logo and some dots. I received plenty of comments from coworkers as they walked by. “What’s with that?” was usually their first question, often followed by, “Is that a speaker?” But no, the top part of the keyboard deck isn’t a speaker — it’s just empty space to keep the hot components away from your hands. We’ll get to the effect this has on thermals later, but it’s a design quirk that certainly takes some adjustment. Though odd, the Zephyrus S is solid. Its chassis is durable and free of flexing, especially in the keyboard deck. The lid has the usual brushed aluminum finish found on many competing systems. Asus seems to love the look, but I would have preferred a different aesthetic. Once opened, the Zephyrus S looks surprisingly modest. Elegant copper trim lines the display and some exhaust vents. The Asus ROG Zephyrus S has a very strange layout. I found a couple of design missteps, though. The first is the hinge, which is a bit too loose. While it’s easy to lift open with one finger, it’s not tight enough to stick at certain angles. It can slam shut on its own if the lid is just slightly open, and that’s not ideal. The second problem is the pop-up vent, located below the keyboard deck. While the chassis itself isn’t wedge-shaped, Asus uses this vent to raise the back end of the device in a slight incline. The vent provides additional airflow to help cool the internals, but it looks and feels flimsy, as if it wasn’t properly screwed in. There’s significant flex in this panel, which is worrying considering the entire weight of the laptop rests on it. 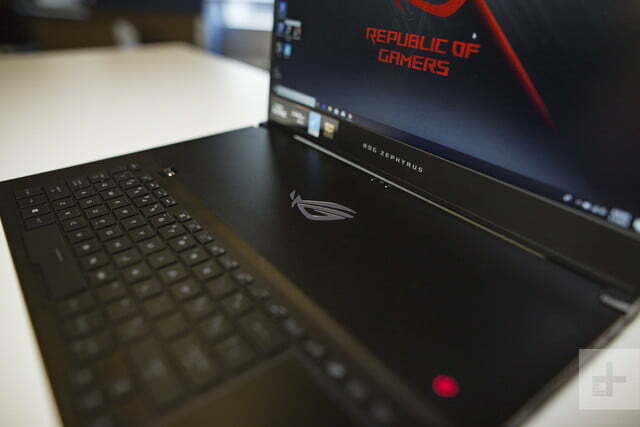 The laptop weighs a hair under six pounds, which makes it one of the lighter 17-inch gaming laptop out there. 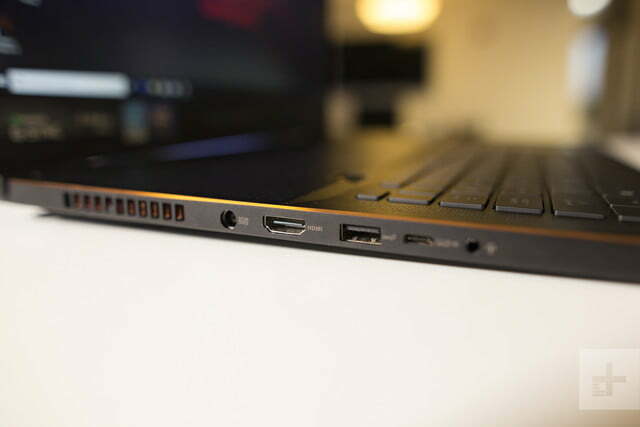 It also measures just 0.74 inches thick, which is thinner than the 15-inch Razer Blade. Some laptops are lighter, however. 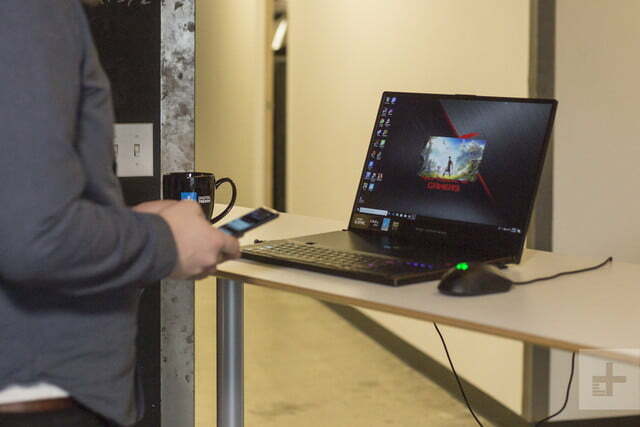 The Alienware m17 beats it at 5.8 pounds, and the MSI GS75 takes the cake at just 5 pounds of heft and a profile just 0.7 inches thick. The Zephyrus S has the basic ports covered. You’ll find three USB-A, two USB-C, and an HDMI port. It does get a bit more complicated than that, though. Only the left-side USB-C port is a Gen2 3.1 port, which provides power delivery and external display support. The Gen1 3.1 USB-C port on the right is only for data. Neither port is compatible with Thunderbolt 3, so external GPUs are out of the question. An Ethernet port is also missing, which will turn off gamers looking for a hardwire option without the need for a dongle. The Zephyrus also comes with a barrel plug for charging, a Kensington lock, and a 3.5mm headphone jack. The Zephyrus S has a very strange layout. Set side-by-side, the keyboard and touchpad hug the bottom of the deck. That means two things for the typing experience. First, your hands rest on your desk while typing, instead of on the laptop’s interior. I only needed a few hours to get used to the placement, but by then my hands were starting to cramp up. More importantly, this layout makes using the laptop on, well, your lap, very uncomfortable or, in many cases, impossible. The Zephyrus S checks all the boxes for excellent gaming on the go, and fast-paced games like Battlefield V or Fortnite feel amazingly smooth. Secondly, because the inputs are side-by-side, Asus had to make some sacrifices to the keyboard layout. The keyboard is small, and the touchpad is taller than it is wide. The key spacing is fine, but the size and placement of the arrow keys is bothersome. Not only are they tiny, they’re also located slightly below the rest of the row. 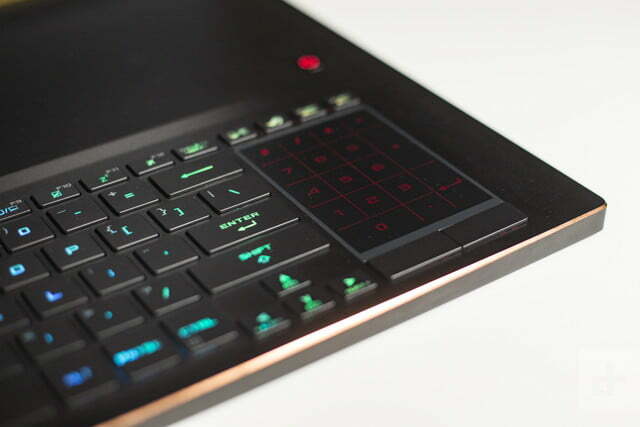 The Razer Blade Pro, which also puts the keyboard and touchpad side-by-side, has a better keyboard layout. It’s a shame, because the keys are comfortable to type on. The 1.4mm of travel is more than adequate, and actuation feels snappy for quick and precise typing. Even the touchpad is high-quality. Tracking feels super-precise and the touch surface’s portrait orientation makes two-finger gestures, like scrolling, easier. 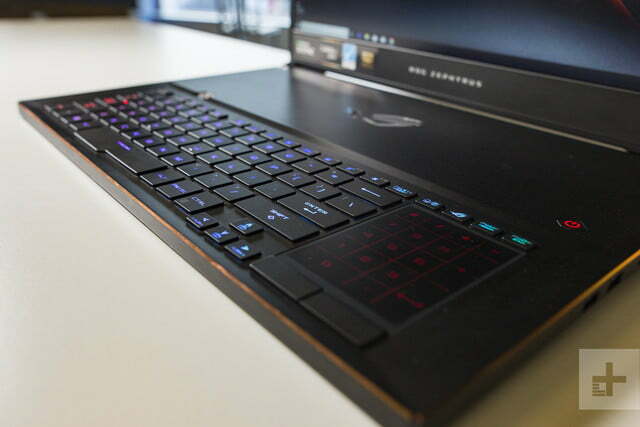 The Zephyrus S makes strange decisions, but they started to make sense when I fired up a game. Placing the keyboard far from the display feels natural, simulating a desktop gaming experience. The keyboard has per-key RGB lighting, customizable within Asus’ proprietary software. The digital numpad, which can be toggled on and off on the touchpad, is accurate and responsive. The Zephyrus S has another surprise up its sleeve; it doesn’t have a webcam, or any kind of biometric authentication. To cut down the size of the bezel around the top, the webcam has been removed entirely, meaning you’ll have to buy an external one if you need it. We’d like to see at least a fingerprint reader on the keyboard deck, but instead, you’ll have to rely on old-fashioned passwords and PINs to unlock the device. 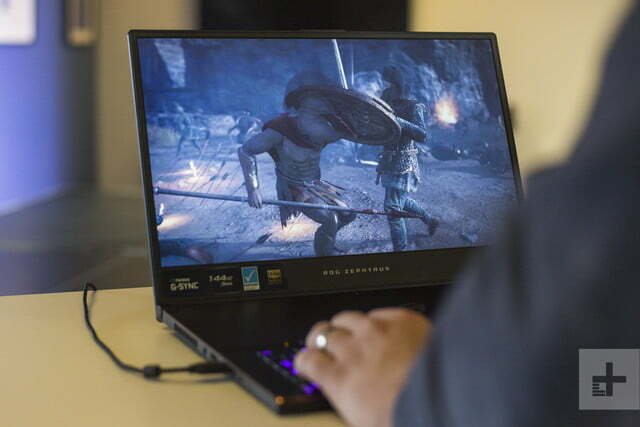 The 17.3-inch display is a 1080p matte panel that’s perfect for gaming. You can pick out pixels if you lean in a bit, but you won’t do that because the keyboard encourages you to sit further back than usual. 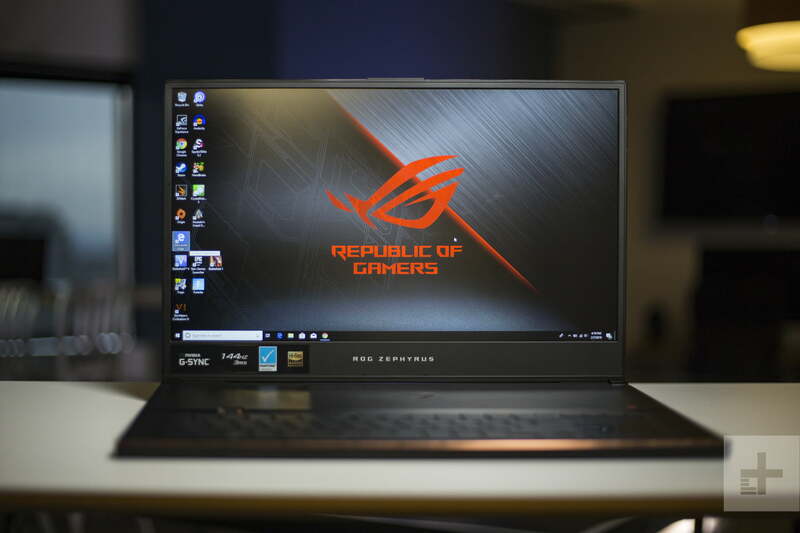 The Zephyrus follows the trend of choosing higher refresh rates over high resolution. To that end, the display offers a 144Hz refresh rate, G-Sync compatibility, and a three-millisecond response time. It checks all the boxes for excellent gaming on the go, and fast-paced games like Battlefield V or Fortnite feel amazingly smooth. Unlike every other G-Sync laptop, the Zephyrus S includes support for both G-Sync and Intel Optimus. That means you get tear-free gameplay when you want it, and better battery life when you’re doing other things. I hooked up our Spyder5 colorimeter and was impressed with the results. It beats out most of the competition in contrast and color accuracy, delivering close to 1000:1 contrast ratio and an average color error of just 1.78. The days of crappy gaming laptop screens are over. Maxing out at 297 nits, the brightness could be better, but the matte finish means screen glare is never an issue. The speakers sound great, too. They offer clear sound that’s loud enough to overpower even whirring laptop fans. We tend to rely on headphones while gaming on a laptop, but we appreciate Asus’ attempts to make the Zephyrus’ onboard audio an option, too. The eccentricities of the Zephyrus S may seem crazy but, as the benchmarks prove, there’s definitely a method to the madness. Our review unit came with an Intel Core i7-8750H. It’s a six-core processor capable of overclocking, which makes it perfect for gaming. The CPU was supported by 8GB of DDR4 RAM and a 512GB SSD. 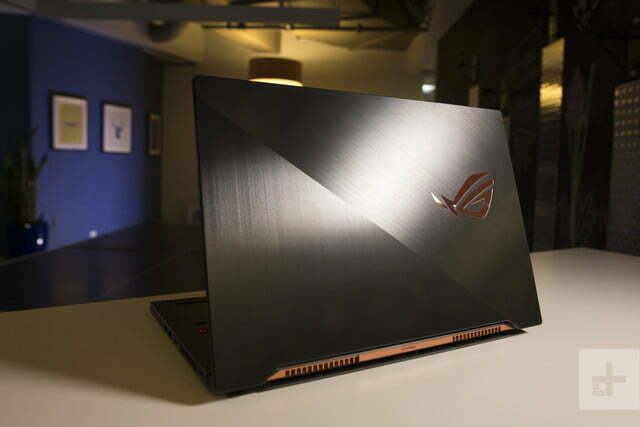 Asus offers multiple configurations, however, with more RAM or hard drive space. We began our processor tests with Geekbench. In multi-core performance, the Zephyrus is neck-and-neck with the Predator Helios 500’s much more expensive Core i9 chip. The Zephyrus S is, however, a bit behind in single-core, thanks to the Core i9’s higher base and turbo clock speed. Real-life tests are even more favorable to the Zephyrus. 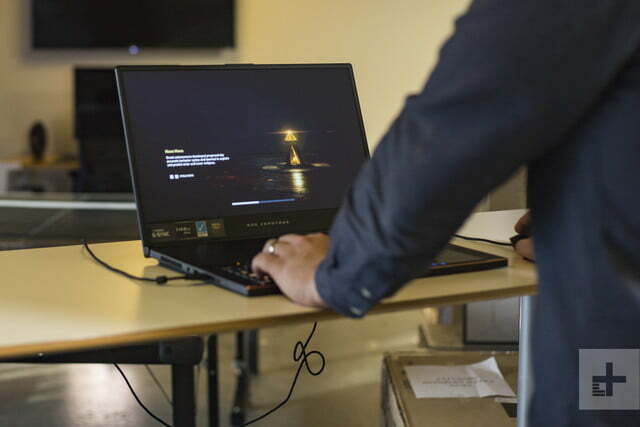 The machine set a record for laptops in our Handbrake encoding test. It encoded a 420MB 4K video clip to H.265 in two minutes and 18 seconds. 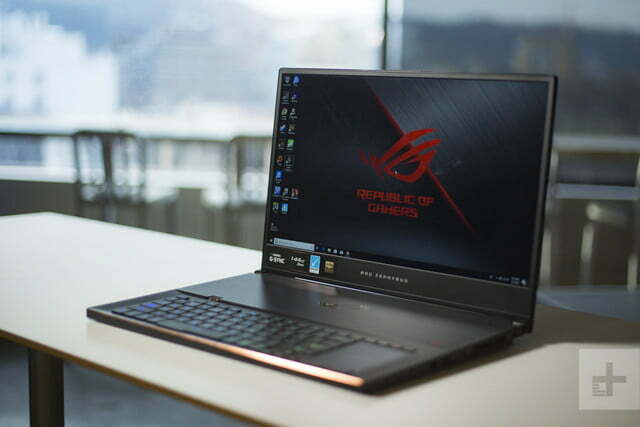 That beats all the Core i9 laptops we’ve tested, including the Predator Helios 500 and the Alienware 17 R5. The pop-out vents serve their purpose. 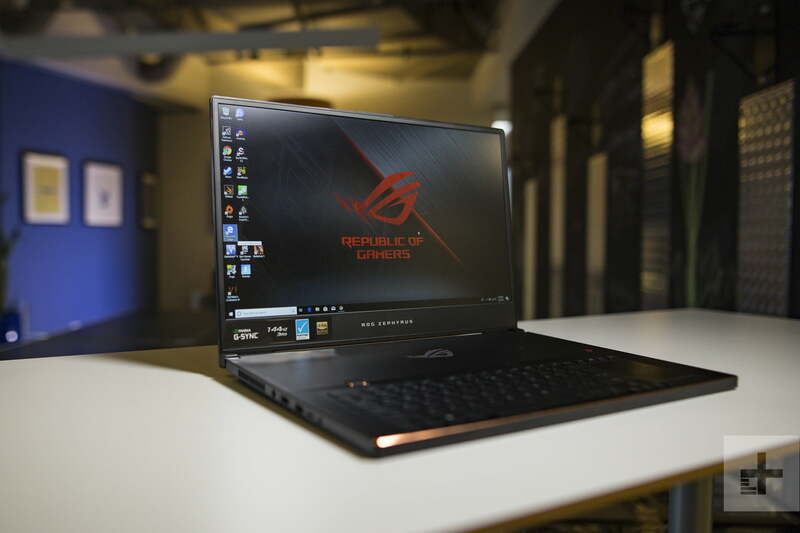 We criticized the 15-inch Zephyrus for its external heat, and the GX701 has the same problems. 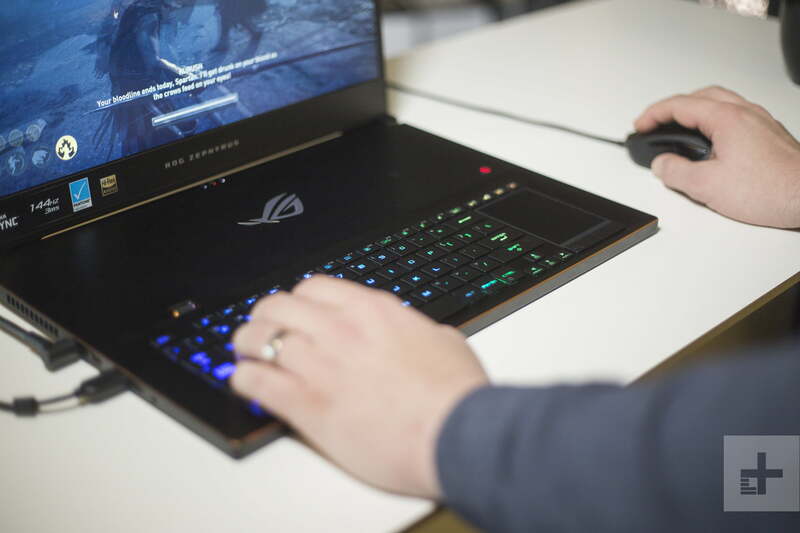 The space above the keyboard becomes very warm during gameplay, as does the bottom of the laptop. Fortunately, your fingers are always a safe distance away, and no one is going to game with the Zephyrus in their lap. It’s no surprise to see ultra-fast storage included with the Zephyrus S. The Samsung SSD was ultra-fast in both read and write speeds, both of which were over well 1000 megabytes per second. Our review unit also had room for two m.2 slots, both of which are available for upgrades in the future. With all the concessions made for the thermal solution, a lot rides on game performance. Fortunately, the Zephyrus S is a winner. The RTX 2080 strut its stuff in 3DMark Fire Strike, where the Zephyrus S easily beats the Nvidia GTX 1080 in the Alienware 17 R5. 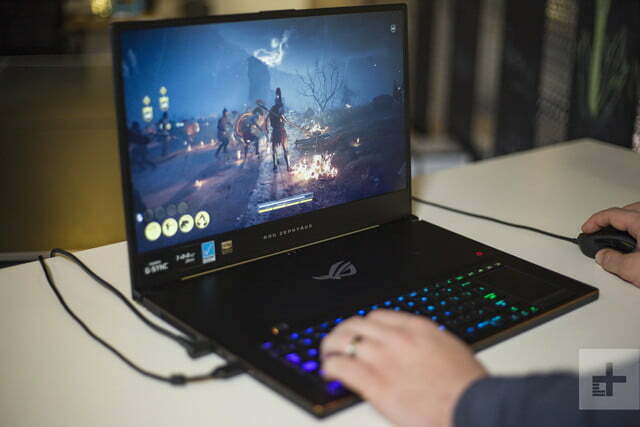 It also offers a 19 percent increase over last year’s 15-inch Zephyrus, which was one of the very few systems to offer a Nvidia GTX 1080 Max-Q. Actual game performance, though, is what matters, and again the Zephyrus S impressed. 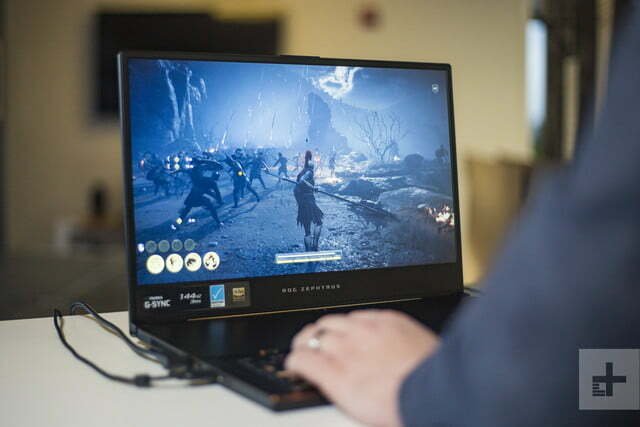 We ran the laptop through a large suite of games including Battlefield I, Battlefield V, Fortnite, Civilization VI, Deus Ex: Mankind Divided, and Assassin’s Creed: Odyssey. What did we find? Fast, smooth 1080p gameplay across every title. We’re talking well over 100 FPS (frames per second) in the Battlefields and Fortnite, and around 95 in Civilization VI. The Zephyrus performs well in tougher games too. It pulled in over 60 in Deus Ex: Mankind Divided. That’s with settings at Ultra detail. Assassin’s Creed was the only game that suffered a bit, as the Zephyrus cranked out only 48 FPS at Ultra. But when we pulled the settings down to High, it reached back above 60 again. Turbo Mode didn’t seem to help significantly, beyond a few frames here or there. We also plugged the laptop into a 4K monitor to see how it handled higher resolutions, and that’s where the RTX 2080 really showed its strength. The Zephyrus speeds past the Predator Helios 500 in Battlefield 1, pushing up to 85 FPS on Ultra in 1440p. It’s playable in 4K too, though you’ll have to turn down the detail a bit to see over 60 FPS. Games look great and play smoothly. However, the performance numbers don’t beat the best we’ve seen. The Alienware 17 R5, the Razer Blade Pro, and even the older Zephyrus S outperform it in some games. These RTX Max-Q cards are not as much about pushing gaming laptop performance beyond what it was before. It’s about doing it more efficiently, and in a smaller form factor. And hey, once we see more titles than actually use DLSS and ray tracing, the Zephyrus S will be ready to handle those, too. 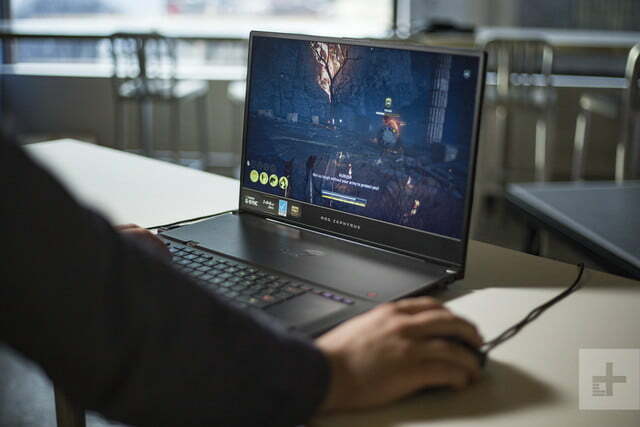 Modern gaming laptops can achieve reasonable battery life. Still, it’s always going to be a bigger problem for a 17-inch gaming laptop. Thanks to G-Sync and the power-sucking GPU inside, the Zephyrus S suffers battery life that’s worse than bad. It’s atrocious. In Basemark, our heaviest battery test, the Zephyrus S only lasted only an hour. Ouch. In our light web browsing test, which cycles through some websites until the battery dies, the Zephyrus lasted an hour and twenty minutes. Our video loop killed the Zephyrus in an hour and 40 minutes. These are among the worst results we’ve seen. The Zephyrus S has a G-Sync panel, which looks great in games but doesn’t allow the system to switch between integrated and discrete graphics. That’s one of the main reasons why the battery life tanks. But Asus knew that. That’s why the Zephyrus S GX701 includes support for both G-Sync and Intel Optimus. That way you can have G-Sync while gaming and use Optimus for everything else. However, this means flipping the “Graphics Mode” switch to “Optimus Mode” in Asus’ Armoury Crate control panel. You then have to restart the laptop. 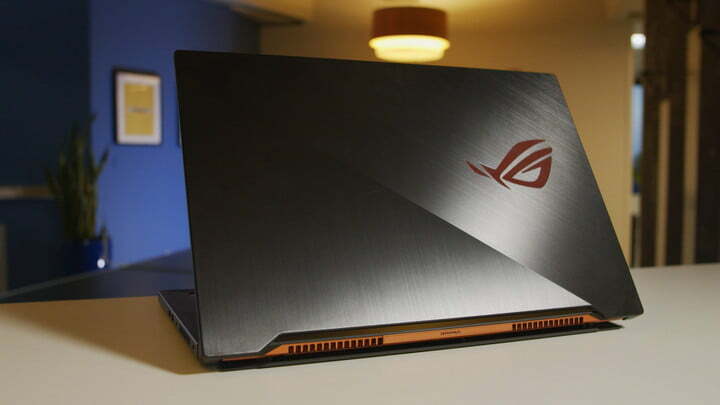 It’s a solution that Asus says it engineered itself and is currently exclusive to its laptops. Turning on Optimus improves the Zephyrus’ battery life from horrendous to merely bad. Our web browsing test gave us 2 hours and 10 minutes of battery life. Though our laptop came with G-Sync switched on, Asus says retail versions will ship with Optimus Mode on by default. The Zephyrus S is a great gaming laptop in some respects. With an RTX 2080 inside and advanced thermals to support it, the Zephyrus delivers smooth gameplay no matter what you’re playing. It also has a killer display, complete with a high refresh-rate and G-Sync support. Yet those benefits come with an uncomfortable typing experience, poor battery life, and a missing webcam. The Zephyrus S might be portable, but it’s more like a mobile desktop than a true laptop. 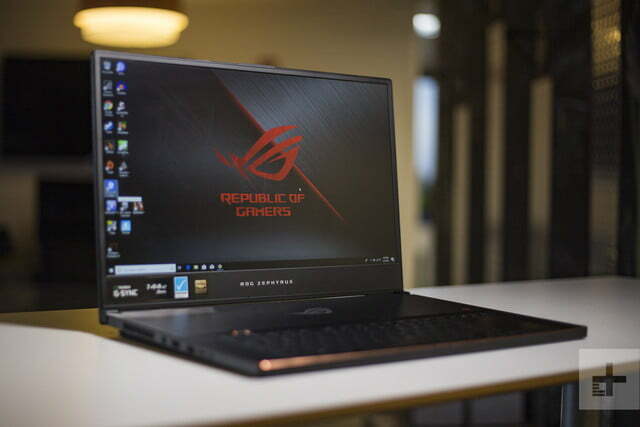 Nvidia’s RTX-20 series graphics launched with forty gaming laptops. Forty. Most of them have similar specs to the Zephyrus S, so there’s plenty of alternatives. Standouts include the Razer Blade, which is still the best gaming laptop that can pass for a normal laptop. If you’re set on a 17-inch laptop, an interesting alternative is the MSI GS75, which is even thinner and lighter than the Zephyrus. The Razer Blade Pro is intriguing, but it hasn’t been updated since 2017, and is starting to show its age. 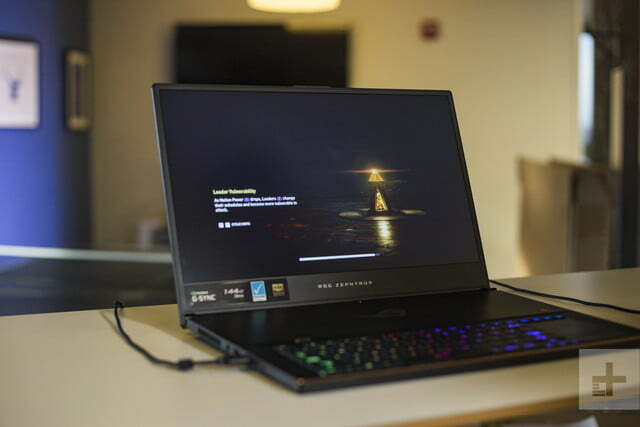 If you want to go all-out on a true “desktop replacement” laptop, take a look at the Alienware Area-51m, which has a desktop processor and upgradable components. No. I applaud Asus’ willingness to try something new, but the Zephyrus hasn’t convinced me the positives of its unique design are worth the problems.